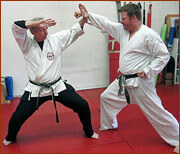 At the Beverly Hills Karate Academy, instruction is available in traditional Shotokan karate. 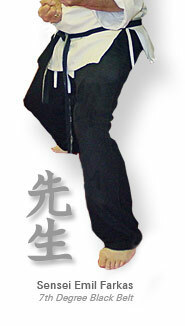 This Japanese martial art, founded by Gichin Funakoshi (Father of karate), teaches students the techniques of punching, kicking, blocking, evading, etc. Students begin as white belts and work their way through various colored belts to reach the coveted black belt. From here students continue to train for advanced black belt, currently up to 6th degree. Although this type of training takes years, there are many benefits. One will get in superb shape, gain self-confidence and learn discipline while working out. For children these classes are a terrific way of channeling their energies into a constructive endeavor that will help them for the rest of their lives. 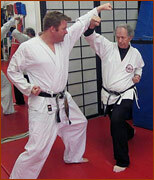 Sensei Farkas, who holds a 7th degree black belt in Shotokan, is a strict disciplinarian. When students earn a black belt under his tutelage, their rank is recognized worldwide.